Since I don’t really change up my daily routine too much to do Monthly Favorites, I thought I’d share my current favorites with you all. 1. 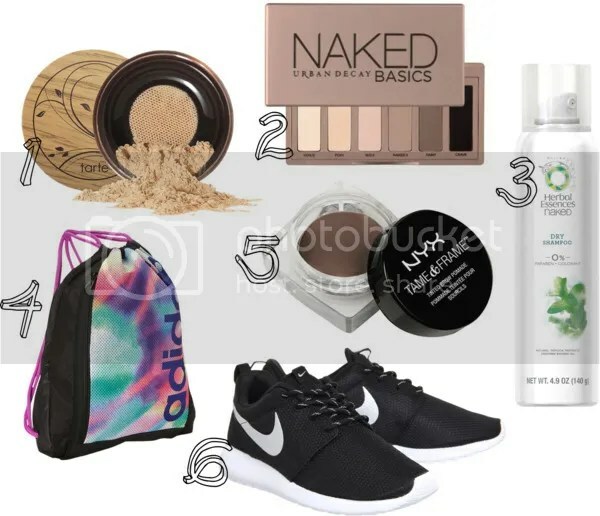 Tarte Amazonian Clay Full Coverage Airbrush Foundation – I have mentioned this product more than a few times on this blog, but I love it so much. For me, it is a tried and true product that I know I can depend on if I want good and lasting coverage. This product feels light on the face, but still gives great full coverage. What I like the most about this product is that it blends so well into your skin and looks natural. For this product, you push your brush into the netting of the product and blend in with a thick make up brush. 2. Urban Decay Naked Basics Palette – This was one of my first Urban Decay products that I have bought. I was tempted to buy one of the Naked Palette, but I didn’t want to commit to buying a $50 palette, so I thought this product was a great alternative. I think this product lives up to it’s name of being a great basic palette. The eyeshadows blend really well and is a great palette to use as a neutral palette. 3. Herbal Essences Dry Shampoo – I know that there is a huge trend right now of not washing your hair everyday, but I am not a true follower of this trend. I get really self conscious about not washing my hair everyday because I feel like my hair gets oily quickly. But there are some days where I get lazy and don’t want to wash my hair. On those days, I reach for this dry shampoo. This dry shampoo does not leave a white cast like most other products and it really helps absorb the oils from your hair and it smells amazing. I section off my hair and spray directly into my roots and rub and brush into my hair and it last all day. 4. Adidas Thunder Sackpack – I have had this backpack for a while now, but it wasn’t until recently that I’ve really appreciated it. I bought this backpack while I was on vacation in Quebec City. What I love about this product is that it is great quality for the price that it is. This bag retails for $17, which i think is a bargain for Adidas. This backpack has a great soft material inside the pack and has convenient zippers to hold all of your stuff. I have had it for nearly a year now and it is still holding up well. 5. NYX Tame and Frame Tinted Brow Pomade – I have been a lover of the ELF eyebrow gel, but I wanted to try something similar but different. This product has great pigmentation , but still gives a natural look. This product really controls your hair and gives you a sharp finish to your brows. 6. Nike Roshe Run – These were my first Nike purchases ever! I have had these for a few years, but I recently fell back in love with these shoes. Wearing these shoes feel like walking on clouds and are so comfortable to wear. If you need good support to your arches, these are great because of the thick soles of the shoe. I love running and trail hiking in these shoes. The only down side to these shoes are trying to keep it clean, but that’s ok because you can just wipe it down and it’ll be good as new. I have two pairs of Roshe Run, but I hope to grow my collection.